The Raymond A. Mason School of Business has deep roots in the history and traditions that has made William & Mary one of the most distinguished liberal arts universities in the nation. Founded in 1693, the University is the second oldest university in the nation-the first was Harvard-and educated many of the nation's Founding Fathers and leaders spanning five centuries, thus earning the name Alma Mater of the Nation. It ranks consistently among the top 10 public, undergraduate liberal arts colleges in the United States. Proud traditions of the University include the founding of the national honor society Phi Beta Kappa and the Honor Code that inspires alumni, students and members of the College community to lead ethical and moral lives. This same commitment to scholarship, service and ethics underscores the mission and curriculum of the Raymond A. Mason School of Business. The Mason School educates the next generation of business leaders by offering a highly personalized, experience-based learning environment that fosters team-building skills, self-reliance, an entrepreneurial spirit and ethical character. This pledge is expressed in the School's educational mission: "To nurture creativity, to mentor high-mindedness, to accelerate ambitions of leadership in our students that they might imagine the great business opportunities of the day and seize them." In 1919 William & Mary President Julian A.C. Chandler established the Department of Business while expanding the University's sphere of services. The study of business grew in popularity over the 20th Century, with substantial growth after the end of World War II. The College established the Master of Business Administration (MBA) Program in 1966. In 1968 the Department of Business became the School of Business, and in 1971, the University's Board of Visitors approved the addition of the Bachelor of Business Administration (BBA) undergraduate degree. One in six undergraduate students at the University major or minor in business, making it the most popular major on campus. In November 2005, the business school was named for W&M alumnus, Raymond A. "Chip" Mason, former Chairman, President, and Chief Executive Officer of Legg Mason. In March 2007, the Mason School broke ground on Alan B. Miller Hall, the new home of the Mason School of Business. 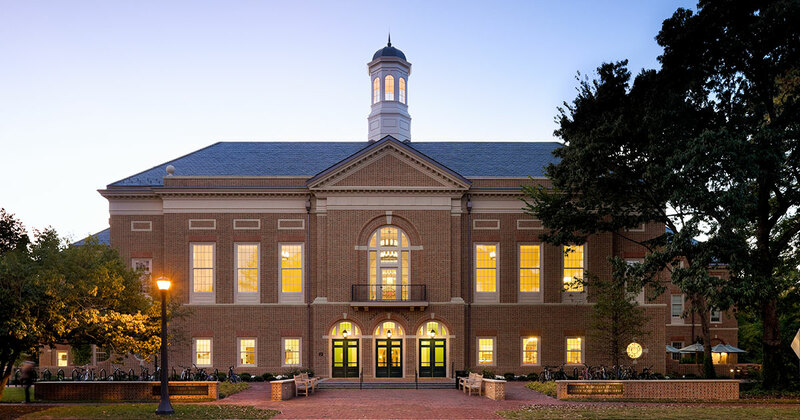 Named for W&M alumnus Alan B. Miller who is Chairman, CEO, and President of Universal Health Services, Miller Hall stands as the "western gateway to the campus" opposite the Christopher Wren Building, the oldest academic building in the country. It opened in Fall of 2009 to the graduate and undergraduate communities of the School of Business and was officially dedicated on October 2, 2009.